TrendMD powers a recommendation widget, which is free for content providers (such as publishers) to install on their website(s). This widget generates recommendations for readers based on their reading habits, allowing for content providers to increase the discoverability of their content. Clicking on the link might take the reader to another article within the same publishers' website(s) - or to a third-party website owned by a different publisher altogether. Each click on a link that directs a reader outside the host publishers’ website(s) earns the host publisher a new visitor back to their site in return. JAMA publishes an article about respiratory disease and would like to promote it. They set a weekly budget, and the article is disseminated through TrendMD’s network. Meanwhile, you’re reading a different article on respiratory disease in The BMJ. Since The BMJ has the TrendMD widget installed, it tells you that you might also be interested in the first article published by JAMA. You click the link. Your click “costs” one credit, which is deducted from JAMA’s credit balance. The BMJ receives a half credit which can then goes towards redistributing their own content—and JAMA enjoys the increased exposure and site traffic. First determine if you are a good fit for our network. TrendMD works best if you're looking to promote scholarly content that is hosted in a central location. Unfortunately we do not currently work with individual authors looking to promote their published works. One of our team members will then reach out to discuss next steps! How do content providers benefit from TrendMD? TrendMD helps marketers generate high-quality views at scale by pushing out content on top scholarly sites. Advertisers use our marketplace to control which content is distributed over TrendMD’s network of publishers. In order to drive traffic that converts into leads, downloads, sign-ups or other engagements, TrendMD’s recommendation engine learns and pushes relevant content most likely to interest your targeted users. You can then capture leads with engaging CTAs on-site. TrendMD looks beyond just related links to help people discover, read, and cite interesting scholarly content from your journals and websites through personalized recommendations. Our recommendation algorithms continuously optimize the placements of links to your content for the right audience while readers are actively looking for something interesting to discover. TrendMD’s dashboard allows you to track incoming traffic, link clicks, and other KPIs in real-time. You can analyze content performance and optimize your campaigns to meet your goals and improve ROI. TrendMD’s content discovery platform recommends content through high-impact placements alongside editorial on top scholarly sites across the web, matching advertisers with relevant publisher audiences across all categories, from STM, humanities, and social sciences. Your content can reach millions of viewers and gain valuable interactive exposure within a credible, trustworthy context. Traditional recommender systems stop at semantic enrichment (i.e. relatedness). TrendMD’s predictive recommendation engine analyzes hundreds of real-time signals to match people with the top handful of items they are most likely to be interested in consuming next. Our proprietary algorithm sifts through an array of situational factors every time the user loads a web page: collaborative filtering (relatedness, audience click behaviour (“people that read X, also clicked on Y”) and personalization (i.e. what you have read in the past), article popularity, geography, context, referral source, social media trends and more. Operationally, the algorithm takes into consideration behavioral, contextual, and social inputs, as well as general network trends and competition. Recommendation links dynamically pair with different articles and change locations across our network, based on where they are most likely to receive the highest click-through rate. Our algorithms are optimized to connect the right content to the right reader, at the right time. Bottom line: content that is generating the most user interest is given the most volume by TrendMD’s algorithm. It also pulls back on content that is generating less interest. Together, this ensures your budget is being allocated effectively. How does TrendMD generate additional article views? TrendMD generates additional article views by recommending your content on articles throughout the TrendMD network. For content providers who have installed the widget and are on our Starter Plan (not paying for credits), about 75% of your additional article views will come from visitors on your own sites finding links to your content in the TrendMD widget (red box below), the remaining ~25% will come from visitors finding links to your content in the widget on third-party sites. Installing the TrendMD widget on your website(s) typically increases article pageviews by 3-5%. “Content discovery” refers to a rapidly-growing space in the world of digital media that involves the use of predictive algorithms to help people discover content they may like but never knew existed. Social media platforms often have discovery-based features integrated into their sites, such as Facebook’s News Feed or YouTube’s “Recommended for You” section. Discovery platforms like TrendMD are built around a predictive engine that all kinds of publishers can integrate into their site, surfacing targeted recommendations for their readers. Content recommendations are offered in a variety of ways on publisher websites and apps. Recommended stories can be placed within content streams/feeds on a publisher’s homepage or along the right side of an article. The most impactful placement often immediately follows the end of an article, though recommendations can also appear mid-article (especially on mobile). These types of promoted recommendations are less intrusive than traditional online banner ads, and the best examples create real value for consumers by providing them with relevant and informative content. Story-driven content also enables marketers to create a stronger emotional connection with their target audiences in a way that direct advertisements cannot. Content discovery can drive results for marketers across industries and in service of many different metrics or goals. While banners ads may only have been effective for high-level brand awareness, content can engage consumers at all stages of the “consideration journey”, driving a variety of goals, such as lead generation, email subscriptions, purchases, and more. Search marketing is a type of 'pull marketing'. Search customers have typed in what they want and they are in the market for your product or service. The customer is "pushing" and advertisers only need to pull them in. These ads are specifically designed to make a 'sales pitch' to the user. 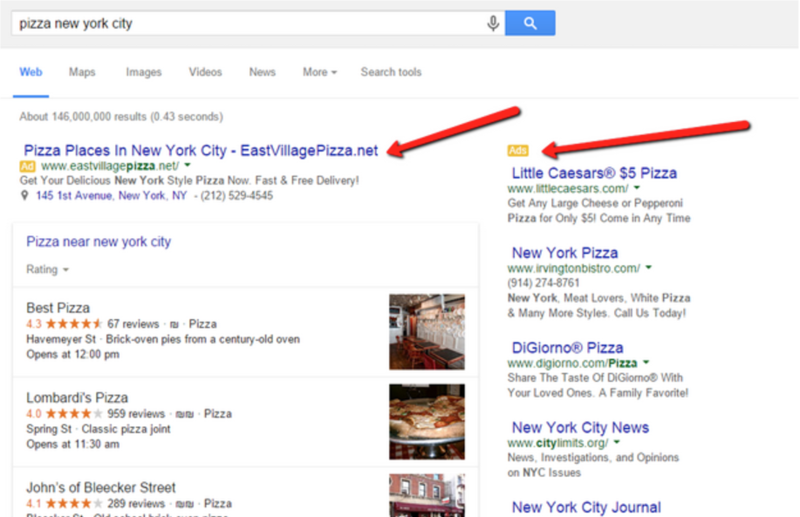 In the above scenario, the user was looking for pizza in New York City. The user is more than likely to click on one of the search ads to learn more about a product or service directly - in this case, pizza. Display marketing is a type of "push marketing". Users are not specifically searching for your product or service when the display ad is placed in their line of site. They may be viewing a video, checking their favorite news or social site, doing research or some other action. Here the advertiser is pushing the awareness of their product onto the user. Display ads are similar to traditional television commercials. The majority of the audience will not have any interest in the product or service (unless highly targeted or via retargeting), at least not at that time. However, it is possible that the ads foster brand awareness, imparting a visual impression in the viewer’s mind so that they may recall your ad if and when they need your product or service. TrendMD is the world’s leading discovery platform, delivering over 1 billion recommendations to over 100 million unique users each month on 4,500 websites from over 300 scholarly publishers. As a content discovery platform, TrendMD surfaces promoted content alongside editorial content at a critical moment, when readers are steeped in “content consumption” mode. This moment is when readers are most open to discovering something new. Is TrendMD only for medical-related content? Not at all! 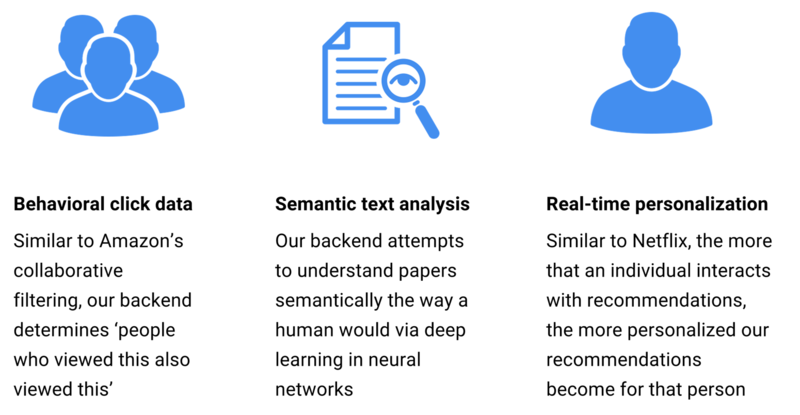 Despite our name, TrendMD is a content recommender system currently used across all academic disciplines ranging from physics to music theory. Will TrendMD ever interfere with my page load times? No. We treat ourselves as a ‘guest’ on your website(s). The TrendMD widget always loads after the rest of the page, and has been designed to never interfere with the functioning of your website(s). This means that sometimes you may have to wait a few seconds for the widget to load on a page. How does TrendMD % traffic lift compare for small vs large publishers? Because traffic lift is a ratio (we look at the number of additional views relative to baseline traffic) the % lift for large and small publishers is comparable. Larger publishers generally have greater quantities of baseline traffic and therefore can earn more credits , but they also need larger numbers of additional views to get the same % lift. When it comes to paid credits , smaller publishers need to pay less to boost their traffic relatively more than large publishers.